If you’re anything like me, then you’ve been waiting with bated breath for the rebooted fourth season of Arrested Development, seven years after it was canceled. I’m a little late to the viewing party game since it aired earlier this week, but watching the show left me wanting one of their signature snacks – chocolate covered frozen bananas, a la the Banana Stand run by the Bluth family (“There’s always money in the banana stand!”). And it occurred to me that not only would they be easy to make, but they’d be a delicious (and fairly healthy!) summertime treat. It turns out that of course I wasn’t the first person to come up with the idea of making my own Arrested Development recipes, but most chocolate-covered banana recipes called for the addition of butter or coconut oil to the chocolate. I’m a bit of a purist and don’t believe in adding things that don’t need to be added so I kept it super simple: bananas and chocolate. That’s it. Some chopped nuts should you want a little flourish, a nice crunch. So they’re vegetarian and gluten free and, if you use dark chocolate like I did, vegan and parve to0! You first freeze the bananas, then dip them in melted chocolate. I was expecting to have to freeze them again until the chocolate set, but something about the cold bananas and hot chocolate made it dry really quickly into a beautiful, shiny, hard shell. You actually have to work quite quickly if you want to dip the chocolate-covered bananas in nuts. It couldn’t be easier, and now I have a cold, perfectly sweet treat waiting for me in the freezer (if you don’t eat them right away they store very nicely in the freezer for up to a few days). 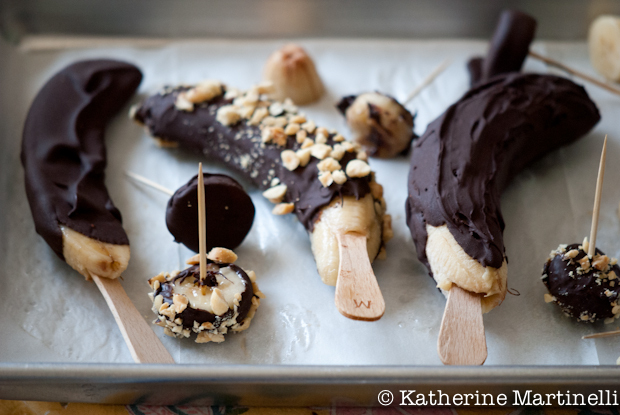 In addition to preparing them in the banana stand fashion (on a stick), I also sliced a banana and dipped them in chocolate to serve with a toothpick for a more bite-sized snack that would also be a cute dessert for a summer get-together. Inspired by the frozen banana stand in the television show Arrested Development, these chocolate covered frozen bananas are the perfect summer treat. 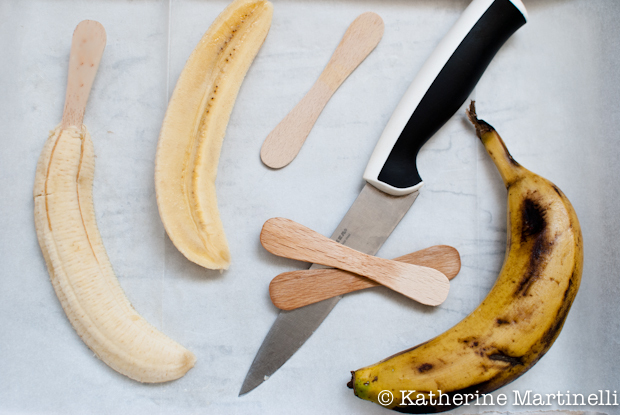 Insert popsicle sticks into each of the banana halves and put on a parchment-lined sheet. Freeze, uncovered, for at least two hours or overnight. Once the bananas are frozen, gently melt the chocolate in a double boiler (I rig one by putting a heat-proof metal bowl over a small pot of simmering water). Alternately, microwave the chocolate until melted. Carefully dip a banana half in chocolate so it is evenly covered, roll in nuts (if using), and hold upright for about 30 seconds, until the chocolate has set (it happens very quickly!). Set down on the parchment-lined sheet and repeat with the remaining bananas and chocolate. Serve immediately or freeze until ready to eat. Vegan and Parve with dark or otherwise dairy free chocolate. Vegetarian. Gluten Free. For a fun party treat or bite-sized snack any time, slice the bananas into coins instead of halves and put a toothpick in them, then continue with the recipe as directed. If the blog hop doesn’t show up below, click HERE to view the collection and submit your links. ALSO – Head over to Food Wanderings to check out my guest post, an amazing recipe for Green Shakshuka, and a Cook in Israel cookbook Giveaway!!! Hi, just delicious. I’m sure we could get away with having these for breakfast!!! These are so fun!! LOVED the new season of AD! So good! I love bananas…Thanks Katherine for hosting such a yummy theme! I am totally going to have to start watching. 🙂 Those bananas look scrumptious, and so easy to do! I may just make some this afternoon as a treat for my kiddos on this hot, hot day. The frozen bananas look wonderful! Excited to start watching season 4 this weekend. I’ve actually never seen that! We just don’t watch a lot of TV for some reason. Anyway, great looking dessert. I love bananas, and am always up for new ideas. Thanks! I want to try it! If summer ever comes that is…. Bananas and chocolate are such a classic combo, and this is a great idea for a healthy dessert, snack or maybe even breakfast (ha – wouldn’t the kids love that idea!?!?). So simple, but such a treat! Thanks! These look awesome. My husband was drooling over some at a festival recently but since we’re vegan we couldn’t eat the ones they had. I have the bananas in the freezer right now. Only thing is, I tried to slice them in half and the banana totally split with the stick. So I have two whole ones in there now. Any tricks for not splitting the banana? Thanks! Yes, getting the popsicle stick in can be tricky – the skinner the better. Even a wood skewer might be good. Don’t put the stick in right at the banana end, but instead a little up where it’s thicker. Of course the other solution is to slice them into coins and use toothpicks instead for bite-sized treats. I really enjoyed having those little bites in the freezer! your presentation but I find this topic to be really one thing that I think I would never understand.